Another former gas station now fuels folks with barbecue. : As it gets harder to find service stations in urban areas, it gets easier to find properties ripe for conversion---and barbecue joints are classic candidates. 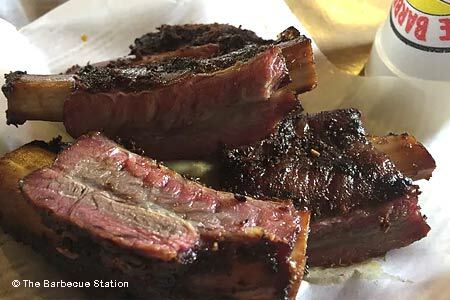 The Barbecue Station’s original tenant wasn’t nostalgically appealing (it’s an ex-Exxon), but the owners have made up for any lack of architectural charm with automobilia---and with good smoked meat. The pork ribs are notable, but the brisket is our fave; it’s moist, acceptably fatty and just smoky enough. The thin, tart sauce from squeeze bottles is hardly needed, though it might be welcome on the sausage. Beef ribs, turkey and chicken are also part of the arsenal, and the baked potato topped with chopped beef or chicken can make a meal in its own right. We are especially fond of the pinto beans from a serve-yourself crock, but if the potato salad seems a little pallid, toss in a few pickles. Pecan tartlets are, amazingly, among the better renditions in town.